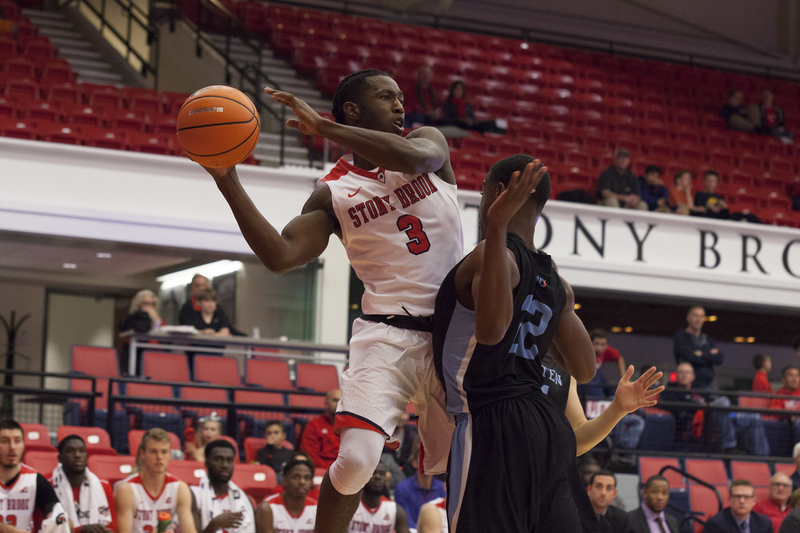 Stony Brook Men’s Basketball saw the momentum shift into its favor against the second nationally-ranked team in the country in Michigan State with 11:49 remaining in the game. A three-pointer from senior guard U.C. Iroegbu cut the Spartan lead to 62-53, and caused the Spartans to call timeout. With the Seawolves shooting over 50 percent from three-point range throughout the game and the Spartans playing out of sync on offense, the game began to swing in the Seawolves’ favor, and the team came out of the timeout prepared to make a comeback. However, that timeout proved to be deadly for Stony Brook. Nine points was the closest Stony Brook came to the lead in the second half. Michigan State began to pull away thanks to shooting over 60 percent from the field in the second half. The Seawolves overall record falls to 0-4 following the 93-71 loss to the Spartans at Breslin Student Events Center in East Lansing, Michigan on Sunday afternoon. The Spartans had four players score in double figures, including two 20-point scorers. Sophomore forward Nick Ward led all scores with 22 points and 11 rebounds, while sophomore guard Miles Bridges scored 20 points and grabbed six rebounds. Freshman forward Elijah Olaniyi led the Seawolves with 16 points, sinking three three-pointers while grabbing four rebounds in 26 minutes off the bench. The Seawolves excelled beyond the arc against the Spartans. Stony Brook has now made double-digit three-pointers in three of its first four games, but this was the first game this season that the team shot 50 percent from three. The team made double-digit three-pointers 11 times last season. Stony Brook poured in 13 three-pointers on the Spartans, the most the team has had all season. Despite Stony Brook’s hot hand from outside, Michigan State dominated other areas of the floor. The Spartans outrebounded the Seawolves 41-25, which led to a 19-8 advantage in second chance points. It was a game no one expected Stony Brook to compete with Michigan State for long, yet it led the game for a majority of the first half. The Seawolves took an early 5-4 lead after a three-pointer and layup from Iroegbu. Both teams traded baskets throughout the first half, but the Seawolves accumulated their largest lead with 9:47 left in the first half after redshirt sophomore forward Akwasi Yeboah made a three to push the score to 25-17. The eight-point lead was the largest lead Stony Brook held, as an 8-1 run for Michigan State catapulted them to a 44-38 advantage at the end of the first half. The Spartans build up that lead throughout the second half before the Seawolves cut it to nine midway through the second quarter. However, Stony Brook looked out of sync after the timeout at 9:47. Despite the Seawolves shooting 47 percent in the second half, a majority of those baskets came late, when the Spartans had all but closed the game out. They allowed Michigan State to shoot 63 percent from the field, missing just 10 shots in the second half. The Spartans also made the most of their free throws opportunities in the second half, missing just three of 18 from the line. Stony Brook will return home for its regular season opener when they take on Brown on Wednesday, Nov. 21 at the Island Federal Credit Union Arena at 6 p.m.